I usually wait until December to put up the Christmas tree, but when Aunt Sallie called and said she’d be passing through and stopping by the next day, I had an immediate change of plans. Aunt Sallie is the family queen of holiday décor. It would be the only time she could share a little holiday cheer, she had said, and as I looked around and saw no sign of Santa, I panicked! I was able to drag the table top tree out of the basement and give it a good dusting, but the ornaments were in a storage area where only my husband could reach. And even if I could get the boxes off their shelves, I wondered about the condition in which I’d find them, recalling my haste when storing them away. I contemplated this little dilemma, igniting my inspiration with a bit of sugar from a candy cane, while cleaning up my sewing area. 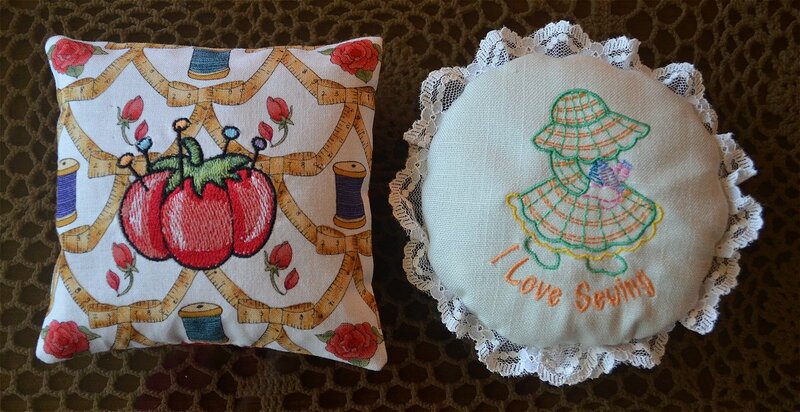 I found a couple of samples and decided it was a shame to tuck nice embroidery into a shoebox. 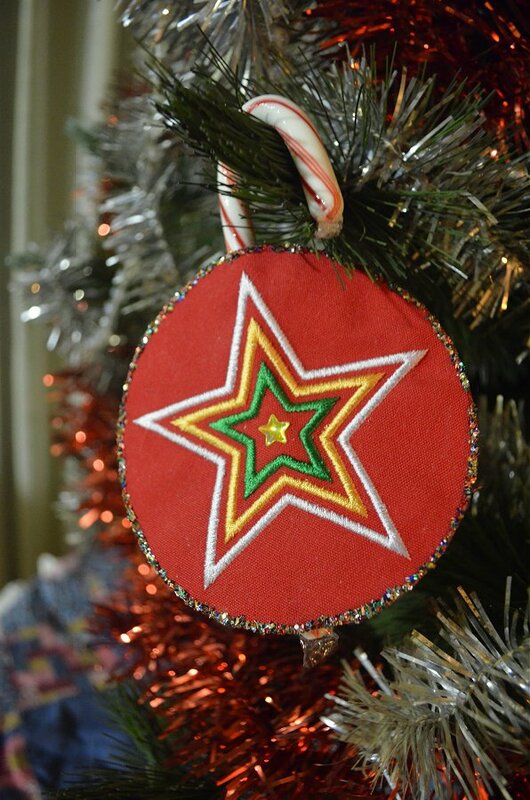 Then, with a candy cane in one hand, embroidered star sample in the other, I recalled seeing similar ornaments that hold candy canes. Yes! As the clean-up mission continued I managed to find a few more embroidered samples that would work fine for ornaments and stitched out other holiday appliqué designs on felt I had in my stash, and then I embellished each with whatever I could gather up in the craft room. I admit some of those that I made may have been improved, had I more time. Some I didn’t add back pieces to and others could have used a ribbon or some sort of pop, but in the end, I realized all was well when I saw Aunt Sallie smile. 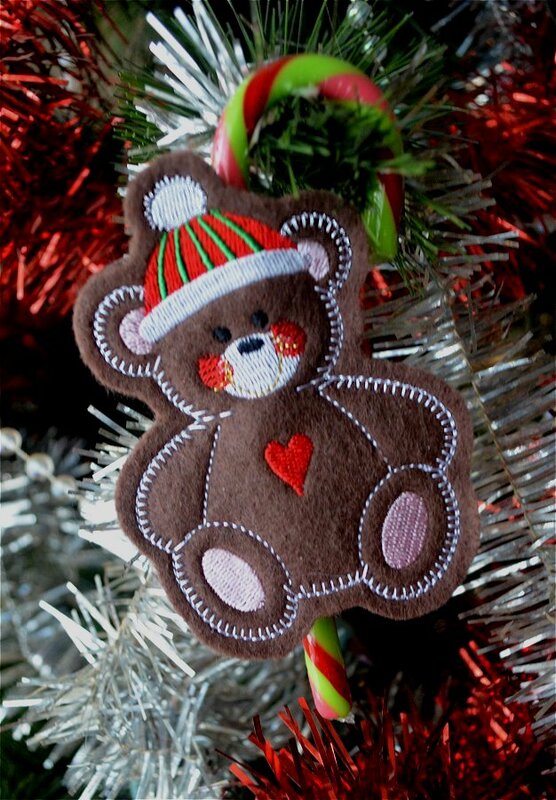 These ornaments can be made quickly, depending on the sewing time of the designs you choose and the amount of embellishment that you desire. 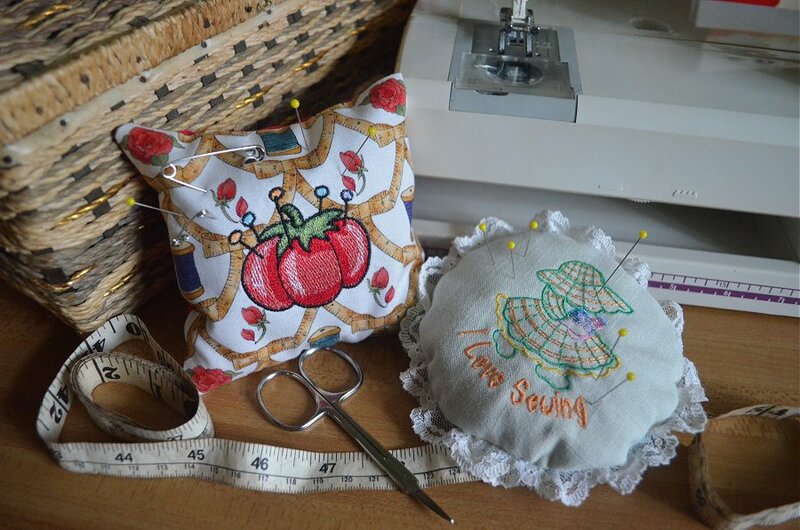 In general, each can be assembled within an hour’s time and they can be created from scraps of felt and other fabrics that you might already have in your stash. 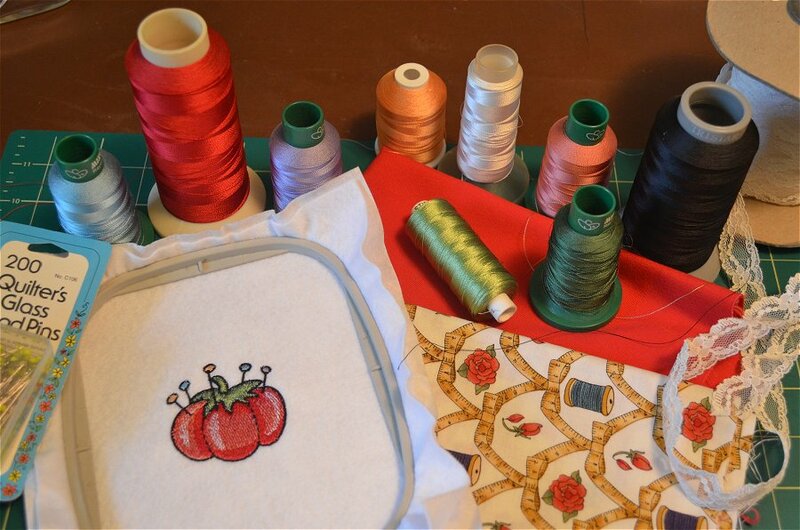 I’ve used appliqué designs in this project because they usually have a satin stitch column outline that works well for the edge of the ornament, but any design could work if you use a little imagination. 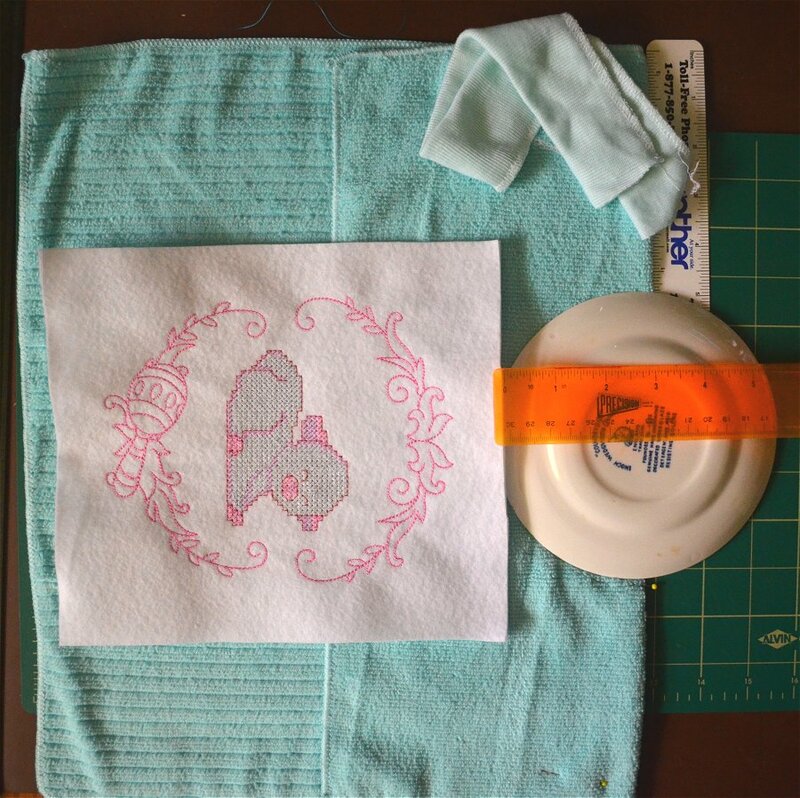 The designs featured in this project require either a 4 x 4” or 5 x 7” hoop. The first five steps are the basic instructions, followed by steps for each of the 10 designs. Gather the materials. 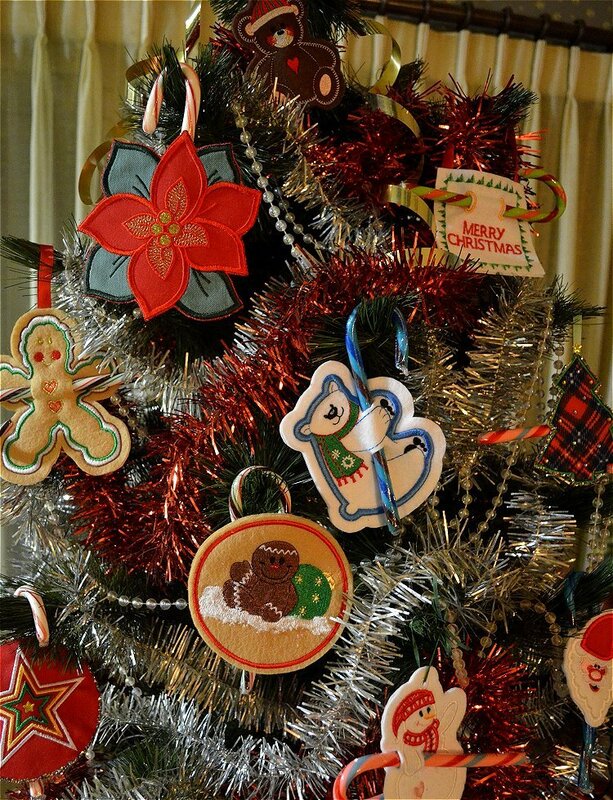 You will need pieces of felt large enough to hoop and stitch each ornament design. 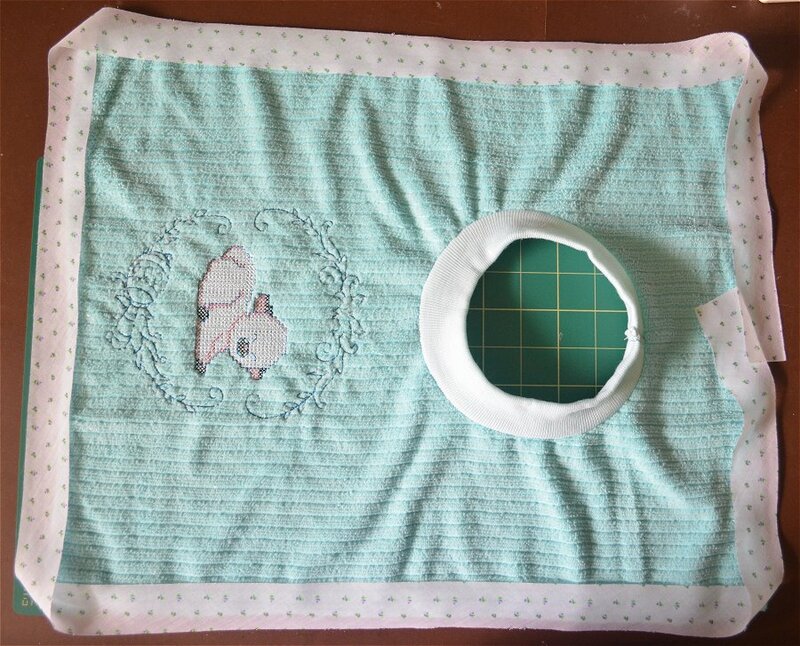 If you have felt pieces large enough for the design but not enough to hoop, you can hoop an adhesive type stabilizer and lay the felt on top for “hoopless embroidery”. Use a heavy weight tear-away or firm cut-away. 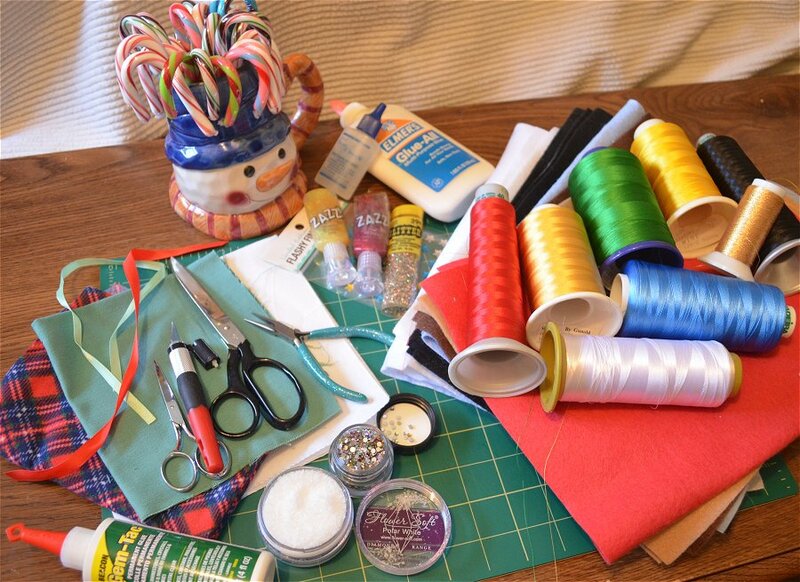 Find those bits and pieces of ribbons and trims in your stash that need a purpose and other materials for embellishment. 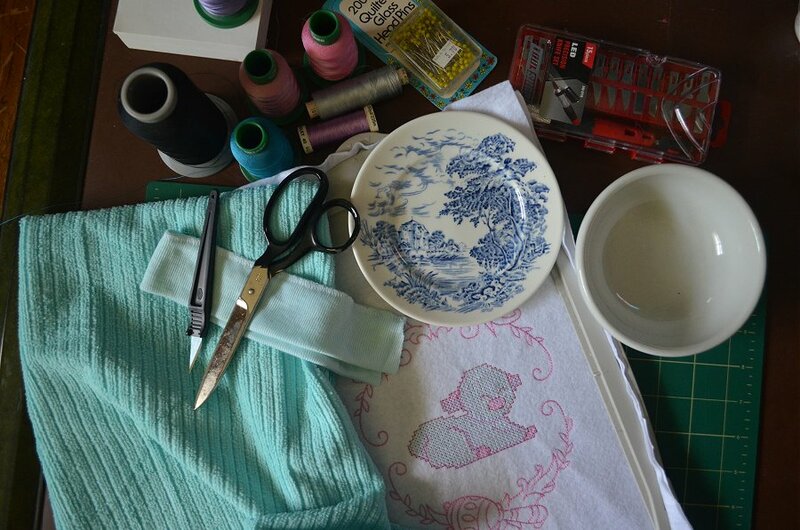 Embroider the designs. 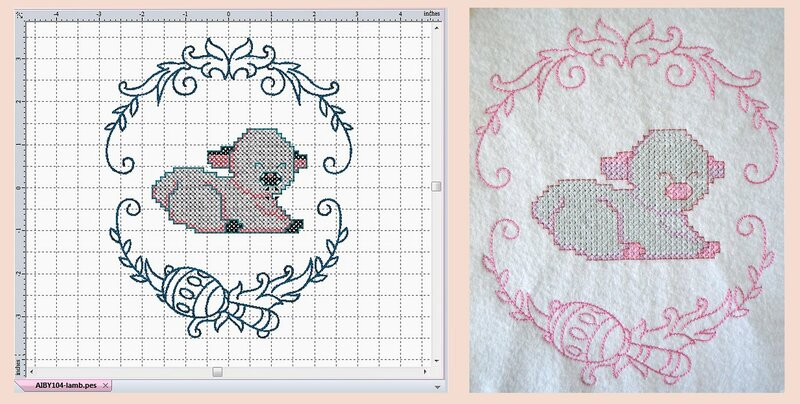 I used designs that are digitized for appliqué but it isn’t necessary to use fabric pieces in all areas intended for the appliqué. 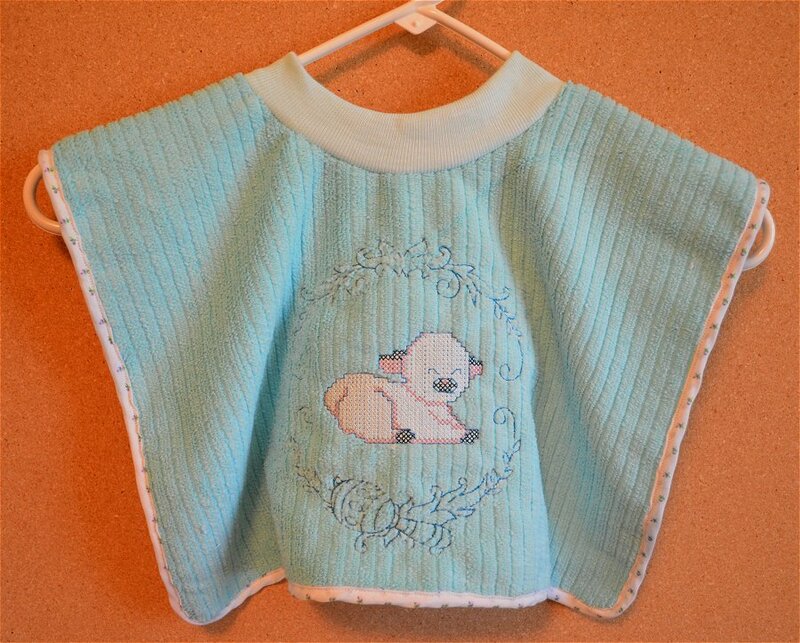 If you choose to use appliqué, the machine will stop after sewing the placement line and you can either set in your pre-cut piece that has been lightly sprayed with adhesive or backed with an adhesive stabilizer, or you can lay a piece of fabric to cover the area, and then stitch the cutline (the next color digitized in the design). 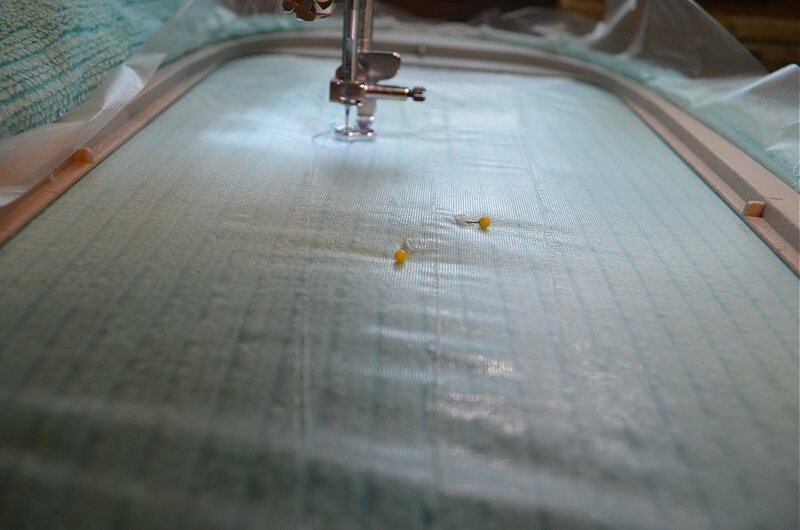 When the machine stops stitching that color, trim away the fabric up to the outside of the stitches and then start the machine again and finish sewing the design. Cut out the designs (fronts) and backs for the ornaments. 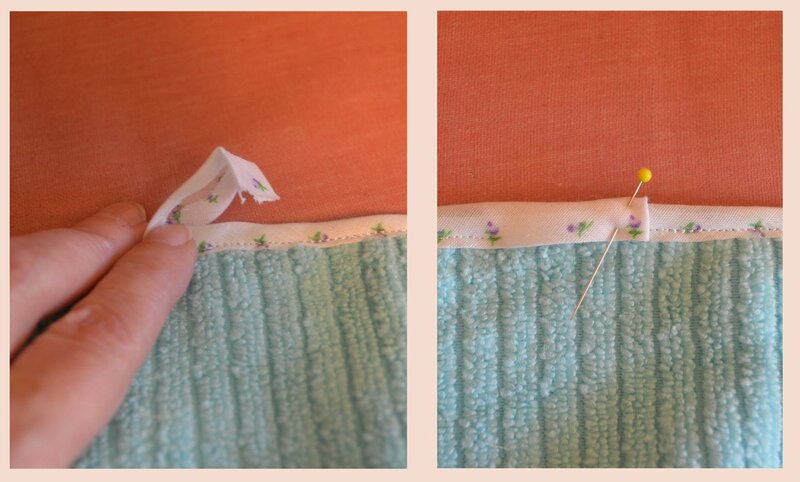 You can cut as close to the border stitches as you prefer, but take care not to cut the stitches. Keep a bottle of Dritz Fray Check handy to dab on any stitches accidentally snipped. To be safe, leave a margin of about 1/4” to the outside of the stitches all around the design by first measuring and marking. For the Polar Bear I used my hem gauge and a ball point pen, marking dots around the outside, and then connected the dots before using a scissors to cut out the ornament. The Poinsettia was trimmed up close to the stitches very carefully with a small hand scissors, and then I pinned the front to another piece of felt and used a craft knife to create the back and cut out the holes for the candy cane (the holes for holding the candy canes should be cut on back pieces before they are glued in place). You can leave the stabilizer in place and it will add to the firmness of the ornament, but you may want to trim away the very outside up to the stitches to avoid any poking out of the edge. 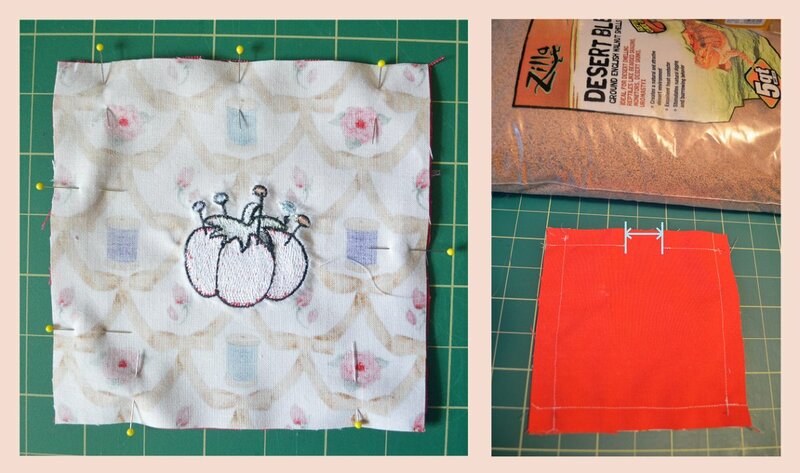 Attach the backs to the fronts with a thin line of fabric or felt glue around the inside edges. Decorate the ornament. 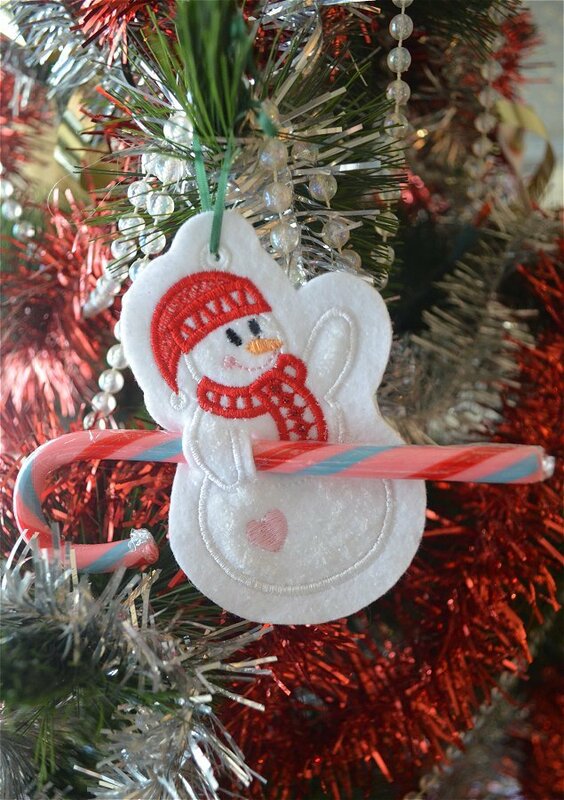 The hook of the candy cane is used to hang the candy cane huggers, but the candy cane holders will need a hanger of some sort. I cut a piece of ribbon about 5” long, folded in half and then I used a couple tack-down stitches to hold in place. You could also use a good dab of glue to attach the ribbon, but you will need to wait until it dries to continue working with the ornament. I used red Zazz glitter glue to seal the outside edges of the Poinsettia. For the Christmas Tree, I applied yellow glitter glue to the front edge and sprinkled multi-colored dry glitter on top of the glitter glue to add more sparkle. 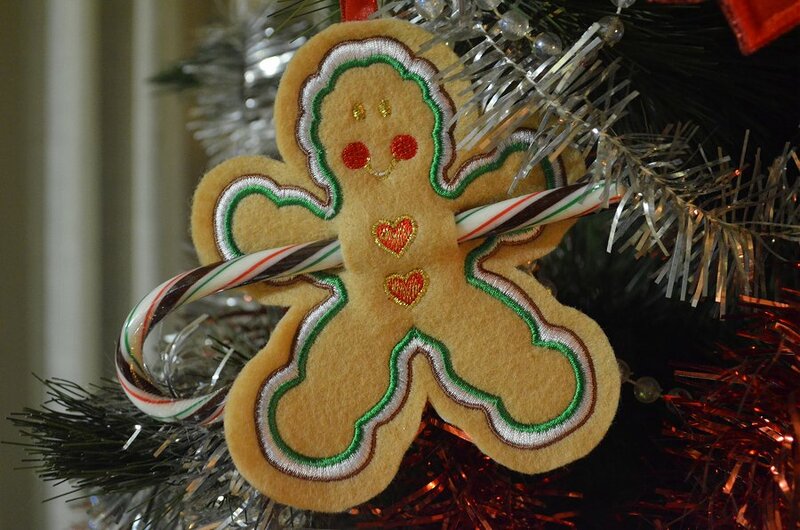 Gingerbread Man Holder: This cute design actually includes a heart on each side of the gingerbread man, but those elements were unnecessary for this project. I chose to delete them from the design before it was stitched, but if you don’t have an editing software program, you can let the hearts sew and simply cut them out of the final ornament. I decided it was fine without adding a back piece to it. 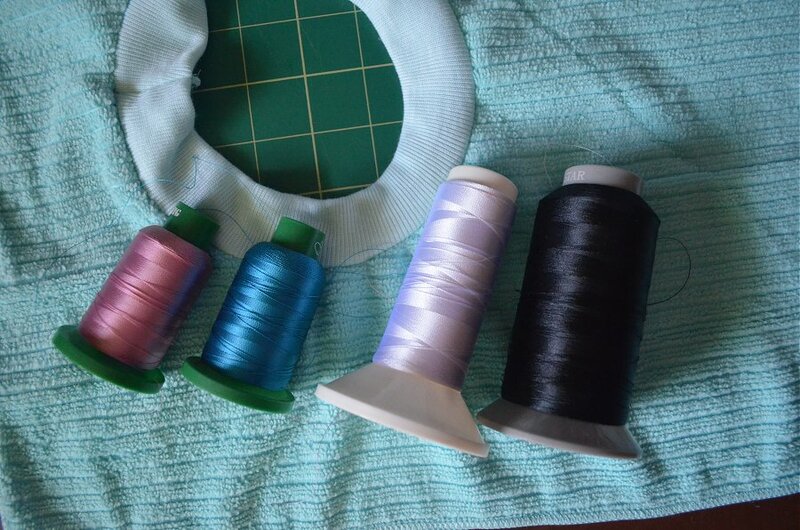 A ribbon was attached for a hanger (as shown in Step 5). 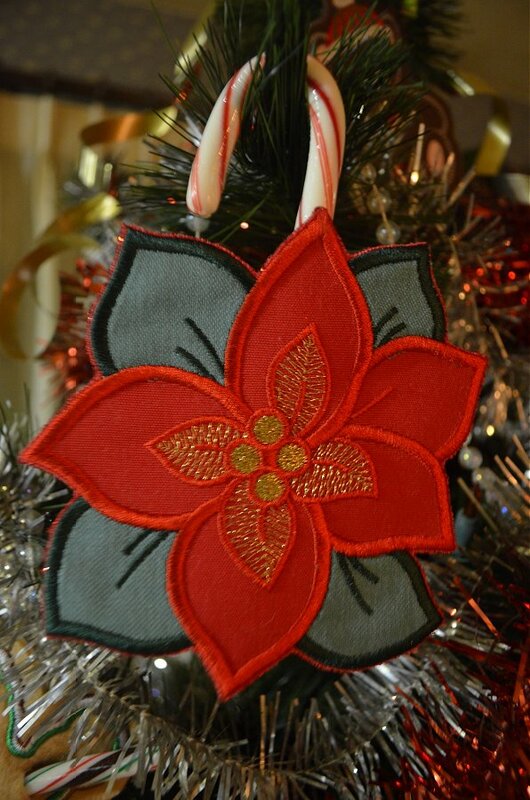 Poinsettia Hugger: This was stitched on the red fabric with green appliqué added for the leaves, and then the entire ornament was backed with red felt. Holes for the candy cane were cut prior to attaching the back to the front (as shown in Step 3). Red glitter glue was applied on the outside edge to embellish and it also hides the white cut-away stabilizer that is sandwiched between the fabric front and felt back. Note, the metallic gold thread that was used for both the berries and inside petals ran beautifully for these elements. Snowman Holder: This was stitched on one piece of white felt and it has no back. After stitching I carefully snipped a hole inside the satin stitch ring at the top for the 11” long ribbon used for the hanger. I chose to leave a 3/8” wide margin around the outside to better support the area where the hole is cut at the outside of the elbow for the candy cane. A pink, red or blue felt with a white appliqué for the snowman may have been a better idea to help the snowman stand out, so I added polar white Flower Soft particles to highlight areas of the snowman. Dots of red glitter glue were dabbed in the center of the elements of the snowman’s scarf. 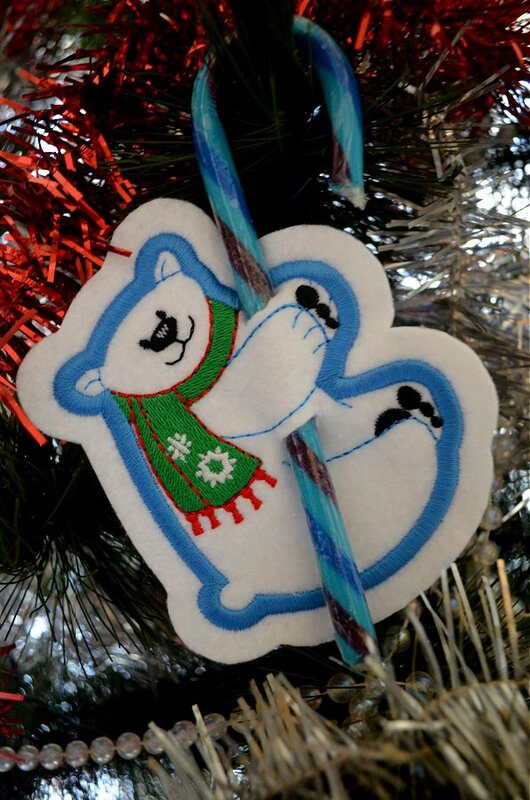 Christmas Bear Hugger: I added a back piece to this ornament because I wanted the candy to be placed vertically and the embroidery wouldn’t allow cutting candy cane holes through the stabilizer. Additional embellishment didn’t appear necessary, though you could add gems or glitter to the eyes for a bit of sparkle. Merry Christmas Holder: This design was likely digitized with the intention of using it for a gift tag; slip a ribbon through the “button holes” to tie on a package or around a bottle of wine. 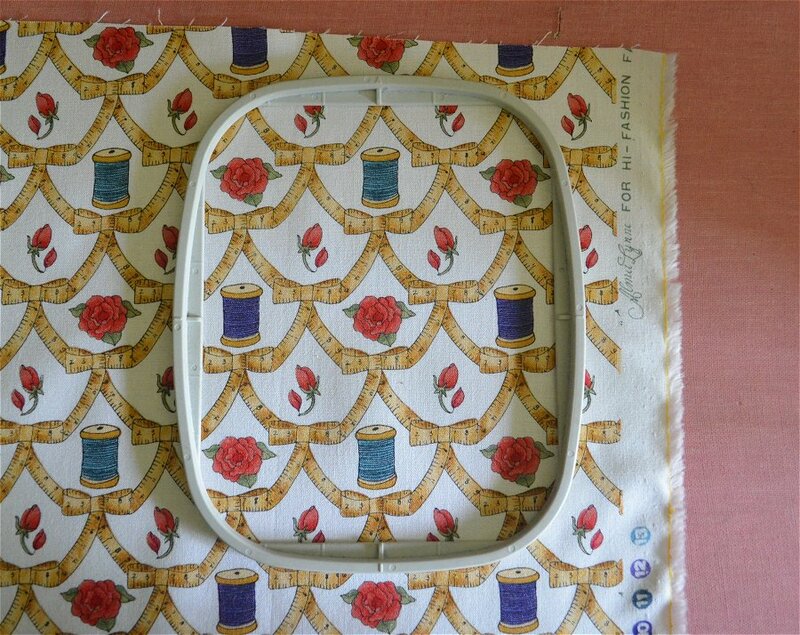 Simply embroider the design, cut around the outside of the border and snip the centers of the button holes, and then attach a ribbon to hang. Star Hugger: I stitched the design on red fabric and cut-away and attached a red felt back with a thin line of glue at the edge. The holes for the candy cane were cut into the back prior to attaching it to the front. I used a template made from shipping cardboard to mark a circle around the embroidery. Yellow glitter glue sprinkled with dry multi-colored glitter was added around the outside edge and a stick-on star was added to the center. 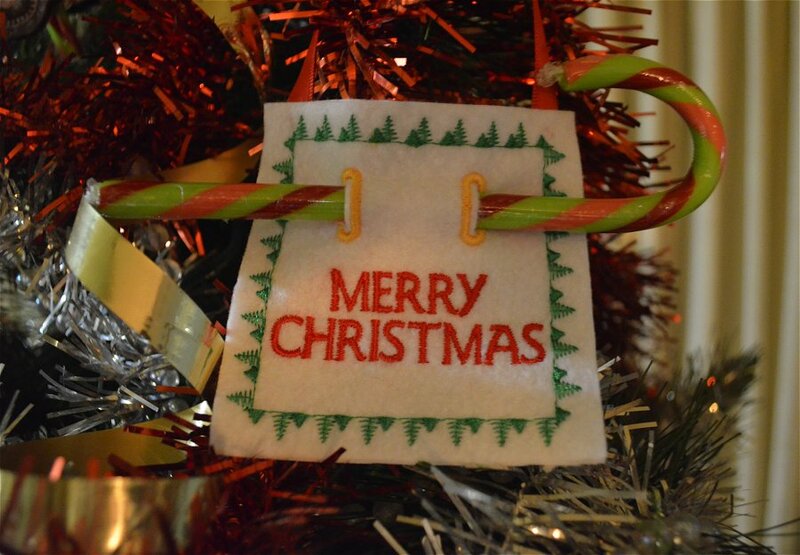 Christmas Tree Holder: White felt and cut-away were both hooped and the design was stitched as an appliqué by adding the plaid fabric after the placement line was sewn. Holes for the candy cane were cut into the stabilizer (as shown in Step 4). Yellow glitter glue with dry multi-colored glitter was added around the 1/8” margin left at the outside of the border stitches. A ribbon was tacked to the back for a holder. A stick-on star was attached to the ribbon at the top of the tree and gems glued on for added sparkle. 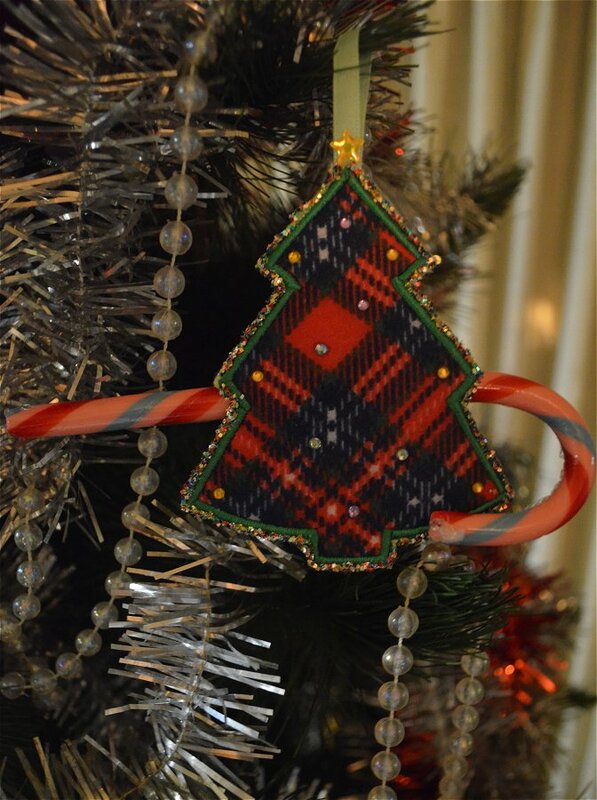 Note, this design is pictured on the product page at EmbroideryDesigns.com with the plaid running horizontally and vertically; I chose to angle the plaid to offer the illusion of garland. 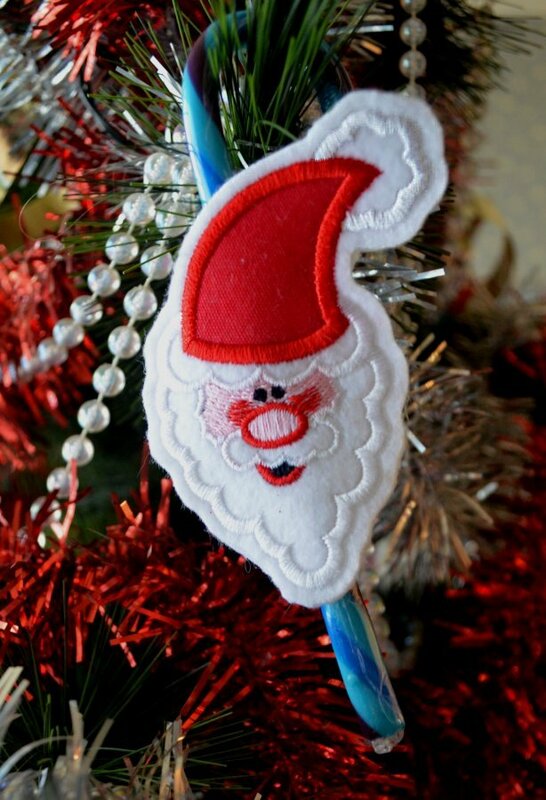 Santa Claus Hugger: This was stitched on white felt and a red appliqué piece was used for the hat. An option for this design is to also use a white piece of fabric like polar fleece for the appliqué that is digitized in this design for the beard and cap tassel. A white felt back was cut and holes cut for the candy cane about an inch apart and the back was attached to the front. No embellishment was added. 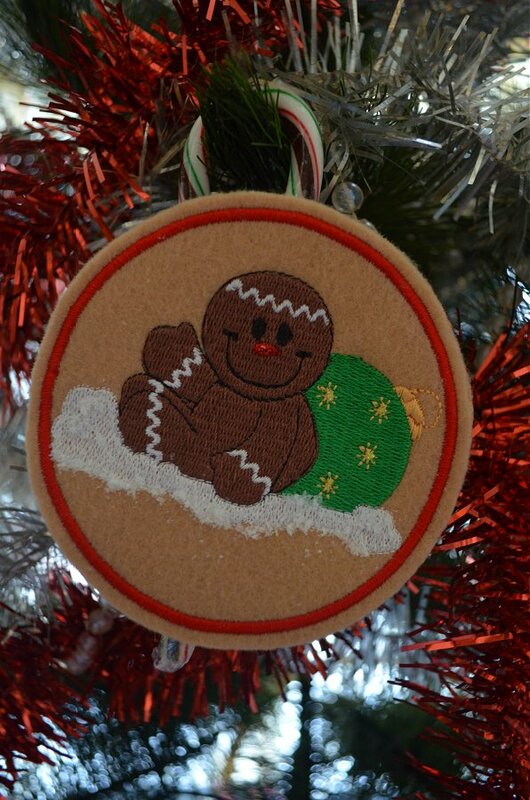 Gingerbread Man Hugger: Stitched on tan felt and a back with pre-cut candy can holes was attached with a thin line of glue at the edge after the stabilizer was trimmed away (as shown in Step 3). I chose to add polar white Flower Soft particles to the embroidered snow and a dab of red glitter glue to the nose and yellow glitter glue to the stars on the ornament. Polar Bear Hugger: This was stitched on white felt and cut-away stabilizer; no back piece was necessary. I cut a 1/4” wide margin around the design (as shown in Step 3). Holes for the candy cane were cut and no additional embellishment seemed necessary. If preferred, you could add a bit of black or silver glitter to the nose and paw pads, or add embellishment on the scarf. 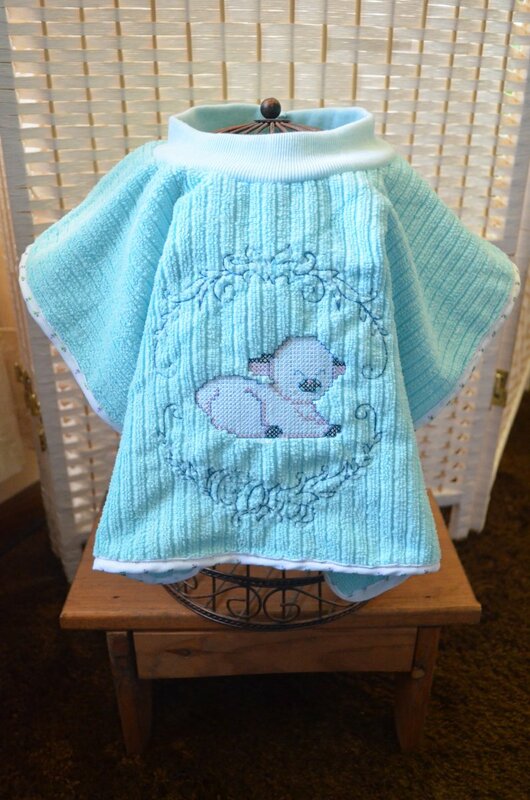 You could also choose to stitch on colored felt and add an appliqué piece of white polar fleece or similar fluffy fabric for the body of the bear that was digitized for appliqué. 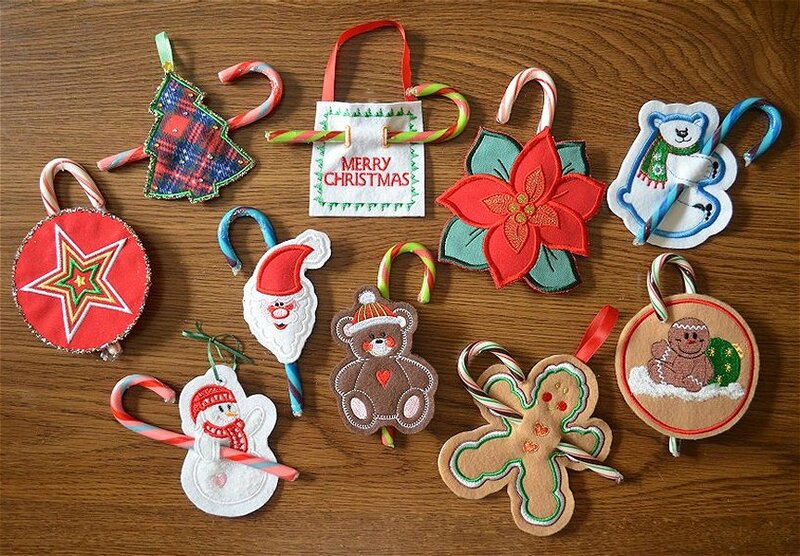 With a little thought, most any design can become a candy cane hugger or holder. Let your imagination have some fun! You may even already have a few embroidered test samples that were screaming for a purpose and what better way to put them on display! You’ll find these instructions and many more to help you decorate for the holidays archived in the Projects at EmbroideryDesigns.com!